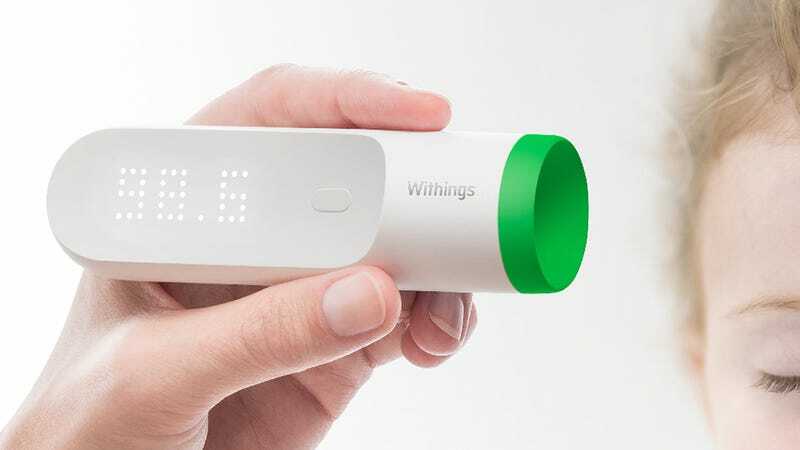 If the thought of sticking a thermometer where the sun don’t shine to get an accurate reading disgusts you, Withings new Thermo provides a far less awkward, but equally accurate way to measure someone’s body temperature with just a simple tap on their forehead. Hidden beneath the Thermo’s green cap are an array of 16 infrared sensors that quickly locate and measure the IR signature from the temporal artery that runs up the side of your face and part of the way across your forehead. In just two seconds the sensor array makes 4,000 measurements which are processed using a special algorithm that corrects for room temperature and heat loss through your skin. This ensures the Thermo can take an accurate reading in mere seconds. Using the Thermo is as easy as placing the business end against someone’s forehead, pressing its single button, and then waiting until a vibration indicates the device has made a successful reading. The results are displayed in Celsius or Fahrenheit via an invisible white LED display, while an additional and impossible to misinterpret color-changing LED indicates possible health concerns with a green, orange, or red warning. Instead of having to constantly charge the Thermo, a pair of easily replaceable AA batteries inside keep it running for up to two full years. And like any modern metrics device worth its weight in plastic, the Thermo can wirelessly share temperature readings—over wi-fi or Bluetooth—to a free Android or iOS smartphone app that can keep tabs on multiple users. The Withings Thermo will be available sometime in the first quarter of 2016 and will arrive with a $100 price tag. That’s considerably more expensive than the traditional glass model your parents used, but kids no longer have to hold anything under their tongues—or elsewhere.